← Hey Dolly! Why so Wonky? I first made this when I was about 14, and in the cookery book they were called Sweet Cinnamon Pig’s Ears. That doesn’t make they sound terribly appetising! Most people will know them of course, as Palmiers or Elephant’s Ears. They have been a firm favourite with friends and family ever since, and they are super easy and quick to make. Even easier if like me you cheat and use ready made puff pastry! Roll out the pastry. If you’re using ready made and ready rolled, leave on it on the sheet – it’ll help you with the rolling later. Sprinkle light brown sugar over the pastry, then sprinkle cinnamon over this. 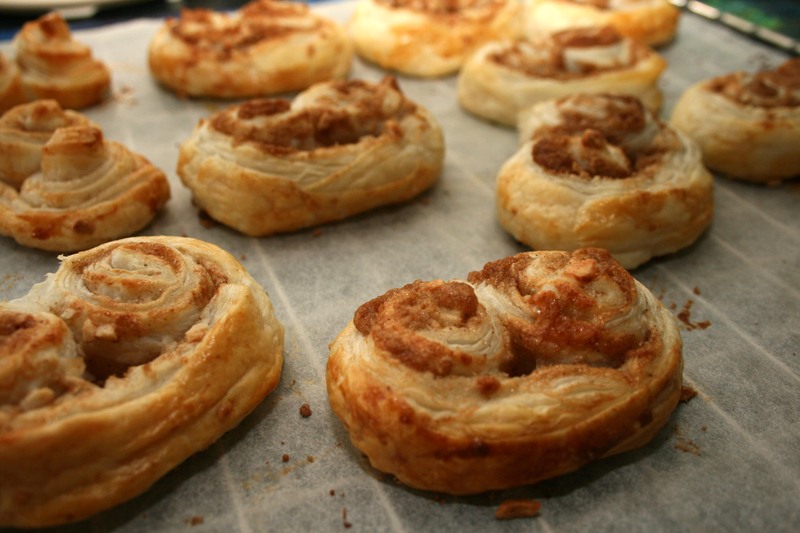 If you find you have areas with too much cinnamon, just swirl it around to even it out. Sprinkle the chopped nuts over the sugar and cinnamon. Normally I prefer to use flaked almonds which I crush up as I’m sprinkling them on. But chopped nuts work just as well. Bend the edges over a little, then slowly and as tightly as you can, roll the pastry into the centre. Where the 2 rolls meet, brush with a little water to help them stick together. **If you want smaller Palmiers, roll the long edges together – this will give more smaller ones. Now cut your rolled pastry into pieces about 1cm deep and place you our baking tray. (Try to make sure your pastry stays cold, it’ll be easier to cut and is less likely to stretch as you move the pieces to the tray.) Some of the filling will fall out. Don’t worry, simply wait until you have them all on your tray then you can sprinkle onto any that look a little sparce once they are on the sheet. Brush each Palmier with the beaten egg then place in the oven for about 20 minutes. The pastry will be a golden brown and you’ll see the sugar has melted on the top. Place on a cooling rack, until cool to touch. Don’t try to eat them before as the sugar is super hot and will burn your mouth! The cinnamon and nutty goodness of these is just perfect to get you in a Christmassy mood! There is no shame in ‘cheating’ with ready-made puff pastry, especially when the result is so pretty!